Activists in Russia attempting to deliver a petition calling for an investigation into human rights abuses in The Chechen Republic were detained by authorities who deemed the delivery of the petition an “unauthorised protest”. 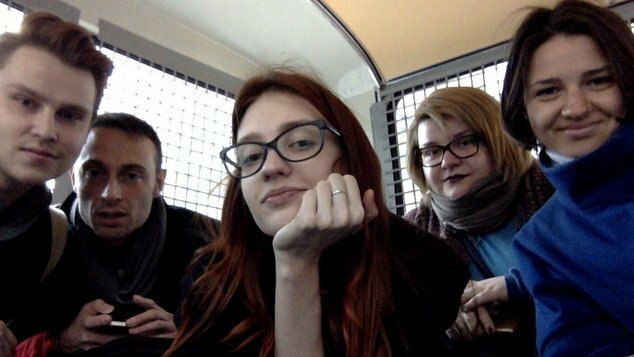 The five Russian activists were attempting to deliver the petition with over two million signatures to the Prosecutor General’s Office in Moscow when they were intercepted and detained by police. The petition was co-organised by Human Rights group Avaaz and called on Russia to investigate and stop gay men being detained, abused and tortured in The Chechen Republic. Located in Russia’s North Caucasus region the Chechen Republic has autonomous rule but is still part of the country. One of the activists was a member of the group AllOut, who are now appealing for people to donate money to help pay the activists fines and court costs. The group were reportedly stopped from reaching the Prosecutor General’s office by a large contingent of police who immediately arrested the group. They posted an image to Twitter after they had been detained. The detaining of the activists has been criticized by human rights groups. Amnesty International decribed the response as a “knee-jerk” reaction. “While the activists were released shortly after their arrest, this knee-jerk detention follows a familiar pattern of the Russian authorities crushing activism, and is a multiple violation of the rights to freedom of expression, peaceful assembly and liberty of person.” said Denis Krivosheev, Deputy Director for Europe and Central Asia at Amnesty International. “It is aggravated by the fact that the detainees merely wanted to support gay men in Chechnya, one of the country’s most marginalized groups, and call for their protection. Bert Wanders, campaign director with Avaaz described the arrests a blatant attempt by Russia to intimidate those standing up for gay people. Wanders said the incident would only draw more global attention to the horrors unfolding in Chechnya. Earlier this week Russian President Vladimir Putin said his government would look into the matter. The Russian president’s acknowledgement of the issue came after more than six weeks of pressure from foreign leaders and human rights activists. News that more than one hundred men and been detained in The Chechen Republic was first reported by Russian newspaper Novaya Gazeta at the beginning of April. The story was dismissed by spokesperson for the Chechen Authorities who declared that not LGBT people lived in the region, chillingly adding that if they did their families would “send to the a place they’d never return from”. Subsequently the British government confirmed Chechen leader Ramzan Kadyrov had been heard making a declaration on local radio, vowing to rid the region of gay people by the start of Ramadan. Last week there were reports that a gay teenager had been killed when a family member pushed him off a ninth story balcony. The teenager had been accused of being gay by the Chechen authorities. British Prime Minister Theresa May condemned the action against as gay men in Chechnya as “particularly abhorrent”. May said her government had raised the issue with Russian authorities and was also looking into ways it could help LGBT people in the region. The British Prime Minister also expressed her countries ongoing concern over Russia’s strict anti-gay propaganda laws which have been in place since 2013. Australia’s Prime Minister Malcolm Turnbull has been criticised for failing to speak out against the persecution of gay men in Chechnya. Foreign Minister Julie Bishop has previously announced that her department had checked to ensure that no Australians were being detained in Chechnya.